Butterfly the prawns by gently slicing open the elbow or outside edge of prawn. There is an obvious thin grey vein to guide you. Open up prawns and place a thin slice of mozzarella on prawn. Place a sage leaf on top of mozzarella. Squeeze the stuffed prawn together (make the prawn look like it did before you butterflied it). Wrap the prawn tightly in the sliced prosciutto. Season with salt and pepper. Grill the prawns in a non-stick pan over medium heat for 3 minutes on each side or until prosciutto chars slightly and prawns are cooked through. Finish prawns with strained oil-cured tomatoes. Preheat oven to 300 degrees F. Place ingredients in oven-safe small saucepan. Cover saucepan with foil and place in oven. Cook for 30 minutes. Remove from oven, strain the oil and reserve. You can use the oil for salad dressing or other marinade. Serve tomatoes atop cooked prawns using a slotted spoon. Heat olive oil and butter in a medium-sized pan over medium high heat. Add onion and shallot and saute until translucent, about 4 minutes. Add garlic and cook 1 minute. Add rice and stir until each grain is completely coated. Add wine and stir until liquid is completely absorbed. Add broth in one-half cup increments stirring constantly until liquid is absorbed before adding more. This process should take at least 30 minutes. Fold in Parmesan cheese and roasted mushrooms. To serve, scoop finished risotto onto center of plate. 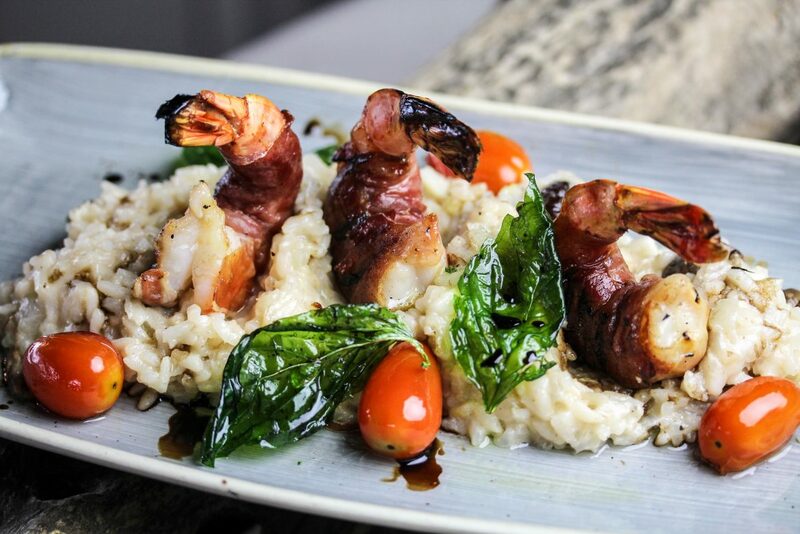 Place sauted prawns on top of risotto. Finish with a slotted spoonful of oil-cured tomatoes.